With the new year comes a new slew of holidays. You already know about favorite holidays early in the year such as New Year’s Day and Valentine’s Day, but there’s a fun holiday squeezed in there that is becoming popular among Americans and RVers. This holiday is known as Chinese New Year in the United States but is translated as Spring Festival. The Chinese New Year comes with a host of fun and activities, and it’s your duty as an RVer to get out there and enjoy them. Our guide to where to stay in your RV to celebrate Chinese New Year will get you close to the festivities. If you’ve never taken part in Chinese New Year before, you’ll be in for a spectacular treat. Consider the three areas below and the RV parks we recommend for getting the most out of your travels. If you are in the heart of the country and are torn between traveling all the way to the east and coast don’t worry, you can stay at Leisure Lake Membership Resort in Illinois to experience all the good times of nearby Chicago’s Chinese New Year festivities. Chicago’s Chinatown is only second to San Francisco’s size, making it in an excellent destination for some Chinese New Year fun. In Chinatown, you’ll find a dancing dragon that is more than 100 feet long, parades, floats, live music, dance performances and educational experiences that dot Chicago’s Chinatown and is sure to be fun for the whole family. San Francisco may boast the best celebration around, but Chicago’s is sure to be a winner. Pro Tip: This is the place to be for Chinese New Year as a traveler in the Midwest Plan ahead, book early, and expect to find yourself enriched and entrenched in one of the best cultural festivals in the country. If you want to go all out on your Chinese New Year festivities than we recommend Pillar Point RV Park located just in Half Moon Bay and less than an hour from San Francisco, California. Why Pillar Point Park? Well, there is a lot of fun to be had at the park itself, but its approximation to San Francisco is the number one reason. Every year Chinatown in San Francisco hosts one of the largest Chinese New Year parades in the world, outside of China itself. The ceremony includes over 100 floats, marching groups and can last well over a couple of hours and that’s just the parade. You can find many other celebrations in San Francisco’s Chinatown for days around this time. If you want the most fun the Chinese New Year has to offer, you can find it in San Francisco and Pillar Point RV Park. Pro Tip: California offers so much to travelers. Take a few extra days at Half Moon Bay to explore San Francisco and the surrounding areas if you’ve never been to The Sunshine State before. We’ve talked about Liberty Harbor RV Park before, and the Chinese New Year celebrations in nearby New York City, New York give you a whole other reason to try it out. San Francisco boasts the nation’s largest Chinatown but has the highest population of Chinese-Americans at over half a million, and they go all out for the Chinese New Year. You can expect plenty of unique cultural experiences and fun including the Firecracker Ceremony and Cultural Festival which includes dance performances, live music and of course fireworks. Years past have seen over 500,000 fireworks erupt over the sky to ring in the Chinese New Year. It doesn’t stop there as you also get to enjoy a grand parade which includes decorated floats, live bands and more. You can cap off your good times by bringing some flowers back to your RV from the Chinese New Year Flower Market. With Liberty Harbor RV Park being only 15 minutes from Manhattan in New Jersey, you can get in and out of the city in a breeze. Pro Tip: New Jersey in February can be hit or miss as far as how cold it can be. Consider bringing layers and ensuring the RV park you’re staying at can sustain your rig during freezing weather. Plan ahead when crossing off RVing for Chinese New Year off your RV bucket list. Many of these nearby RV parks and campgrounds, along with hotels, sell out quickly – especially in the above three parts of the country. 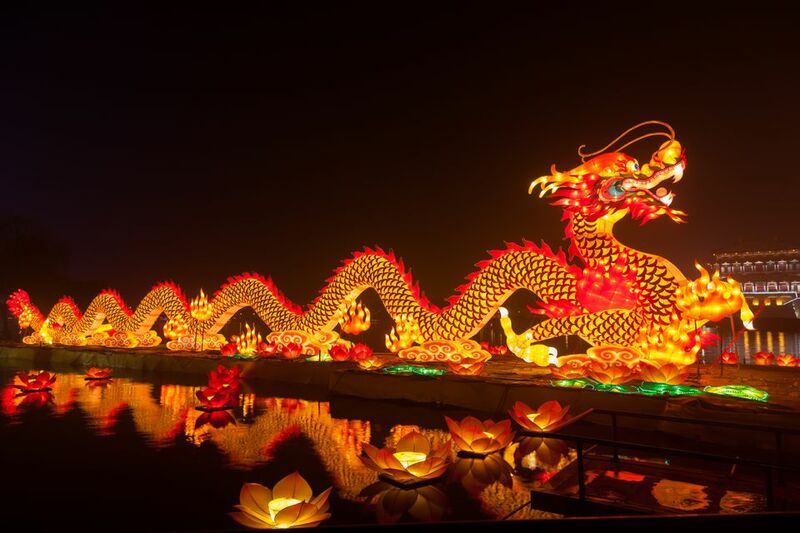 Enjoy the dragons, fireworks, and the lore behind Chinese New Year by RVing to a new city and a new experience.